It's strictly forbidden to have a peek into the kitchen. But you're welcome! The idea of the restaurant was to offer authentic northen italian food at affordable prices. Rodrigo had worked in restaurants for ten years and Carlos had been working as a sous chef in Bice ristorante for 5 years at the time so that's how they came about the idea of opening the restaurant. Basilico means basil in italian,and the first thing that Carlos had to do in a kitchen was to chop basil, hence the name of the restaurant. Rodrigo's brother Luciano was in the bussines for five years before tagging along the project with the two friends and the team was formed to start this wonderfull experience. 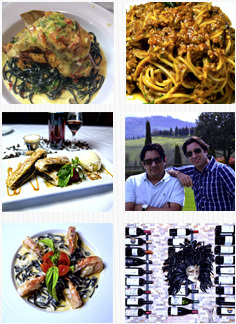 Basilico has been rated "excelent" by Zagat in 2002 and every year on since then. It gives us such pride and joy to know that we are touching people by doing what we love, and to have met so many beautifull people along the way, we can't be thankful enough to our customers/friends who without their ongoing support and patronage we wouldn't be here, thank you and we love each and everyone of you. We offer over 60 labels of wine from all over the world and our signature dish is "linguini frutti di mare", which has been voted best of Miami by the New Times in 2002. To us ,there's nothing better in life than to share great food,great wine and great frienships, and when you can combine those three things in one table, is a recipe for heaven so, cheers and buon appetito!!!!! Every time I am in Miami.... I would feel cheated if I did not go to this restaurant. The staff is terrific, the prices cannot be beat and the food is great. Believe it or not .... I come in from L.A. three times a year... and they remember me. I stopped in on a Monday around 5 and ordered the seafood risotto. The service was top-notch, and the food was perfectly prepared. There was more seafood than risotto; the ingredients were fresh, and the flavors were well-blended. I highly recommend this restaurant if you are in the Doral area. Excellent food and exceptional service, extensive wine list including every day table wines and high end wines as well with different format bottles, an Italian cuisine jewel in Miami we were very pleased and looking to go back. I went to Basilico to try going to get married small wedding with ten guests. Yes, will do it at Basilico. Awesome service and delicious great food. I went to culinary School so for me to say this is good. We were just waiting for a flight. Looking for a place to eat, our expectations were low, but this place blew us away. Friendly, generous servings if absolutely delicious authentic food. The tomatoes were fresh and delicious. The house wines were great. We never would have walked in the door from just walking by, but once inside, it is very clean and simple.